NEW YORK, NY – Greg Norman and Caribe Producers LLC. 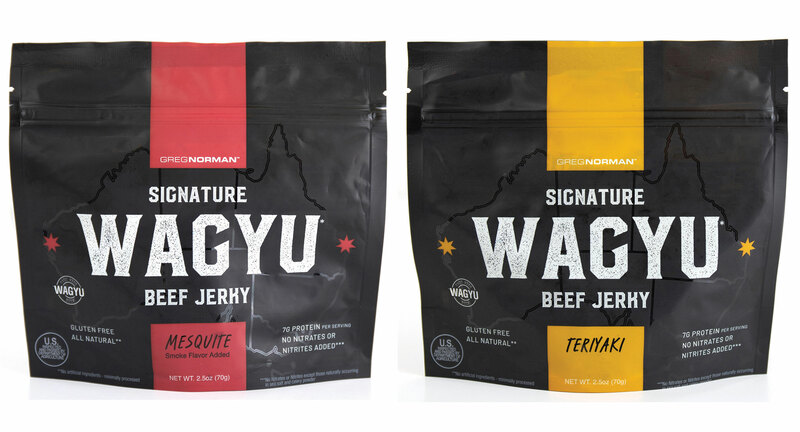 announce the release of Greg Norman Signature Wagyu Beef Jerky - the first 100% Australian Wagyu Beef Jerky in the United States. Greg Norman Signature Wagyu Beef Jerky is available on Amazon and will be hitting shelves nationwide this year. Authentic Brands Group (ABG) is a brand development, marketing and entertainment company, and the owner of the Greg Norman brand. Headquartered in New York City, ABG manages, elevates and builds the long-term value of more than 50 consumer brands and properties by partnering with best-in-class manufacturers, wholesalers and retailers. Our brands have a global retail footprint in more than 50,000 points of sale across the luxury, specialty, department store, mid-tier, mass and e-commerce channels and more than 4,520 branded freestanding stores and shop-in-shops around the world. ABG is committed to transforming brands by delivering compelling product, content, business and immersive brand experiences. We create and activate original marketing strategies to drive the success of our brands across all consumer touchpoints, platforms and emerging media. Our portfolio of iconic and world-renowned brands generates $8.6 billion in annual retail sales globally and includes Marilyn Monroe®, Mini Marilyn®, Elvis Presley®, Muhammad Ali®, Shaquille O'Neal®, Dr. J®, Greg Norman®, Neil Lane®, Thalia®, Michael Jackson® (managed brand), Nautica®, Aéropostale®, Juicy Couture®, Vince Camuto®, Herve Leger®, Judith Leiber®, Frederick's of Hollywood®, Nine West®, Frye®, Jones New York®, Louise et Cie®, Sole Society®, Enzo Angiolini®, CC Corso Como®, Hickey Freeman®, Hart Schaffner Marx®, Adrienne Vittadini®, Taryn Rose®, Bandolino®, Misook®, 1.STATE®, CeCe®, Chaus®, Spyder®, Tretorn®, Tapout®, Prince®, Airwalk®, Vision Street Wear®, Above The Rim®, Hind®, Thomasville®, Drexel® and Henredon®. For more information, please visit https://www.authenticbrandsgroup.com/.